Have you ever tried to clean the outside of a window when it was too hard to reach the middle of the glass or it was too high off the ground? Maybe you thought about using a ladder, climbing out on the roof, or removing the window from its frame. Forget about all those things. There is a super easy way to make your windows shine. Just use a magnetic window cleaner! The company called Tyroler came up with the perfect way to clean the inside and outside of your windows at the same time with minimal effort. 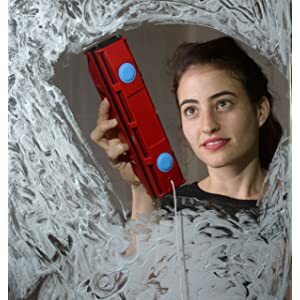 In this glass magnetic cleaner review, we’ll look at three Glider models suited to three different kinds of windows. Let’s see which one will be the best at making your home look great. The Tyroler Glider S-1 is perfect for cleaning single glazed windows that only have one pane of glass up to 8mm, or about 1/3-inch, thick. It’s a well-thought out invention that’s very easy to use. First off, take a look at the two parts of the Glider. Each of the two parts have squeegee rubber blades on all four sides. Those face the window glass to spread out your cleaning liquid in front of it and then clean it off. The thinner part of the Glider goes on the outside of the window. It comes with a safety cord and finger ring. Shut the cord inside the window to secure it, or else hold the ring in your hand so that the Glider won’t fall to the ground by accident. The thick half of the cleaner stays inside with you. 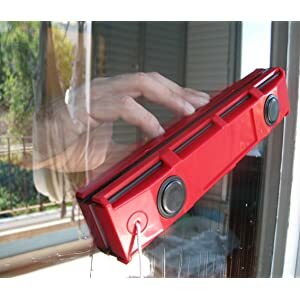 It’s about the right size for most adult hands to grip easily so you can steer the cleaner around your window pane. Inside the Glider are powerful magnets that attract the two parts of it together right through the glass. Once they are mounted on the window, the two sides work together as one tool. You can literally clean both sides of the glass at once. Once you’ve squeegeed off the cleaning fluid, you can place the two microfiber cloths on top of the rubber blades to clean up the edges and shine up the window. This method works on glass-fronted cabinets, coffee tables, and other glass furniture as long as the thickness doesn’t exceed 1/3-inch. Tyroler says that the magnets will never wear out and neither will the squeegee blades. The microfiber cloths can be washed up to 300 times before they stop working at their best. The Glider S-1 comes with a plastic spacer for storage. Using this makes it simple to separate the parts when you’re ready to clean. But what if you have double pane windows? Can you still use the Glider? Of course, check out the D-2 described below. If you have energy-efficient, double-paned windows up to 20mm, or 0.79-inch, thick, you need the Glider D-2. The D-2 looks and acts the same as the S-1 window cleaner. The difference lies in the magnets. The D-2 has stronger magnetic force than the S-1 so it can handle thicker glass. Like the other Glider models in this review, it has rubber squeegee blades on all four sides. It comes with two microfiber cloths that last for up to 300 washes. 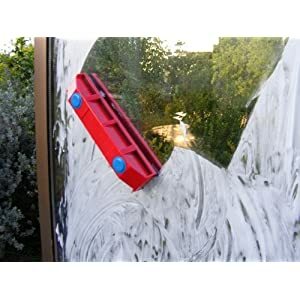 The manufacturer recommends using the cloths first to scrub very dirty windows before using the rubber blades. You can also use the cloths for a finishing touch to remove extra cleaning fluid from edges and polish the glass. The squeegee blades are made from high quality rubber created to last for years of service. The magnets themselves will never wear out and don’t use any batteries or electricity to operate. But since they are so strong, Tyroler recommends using the plastic spacer to store the two halves of the Glider separated from each other. If you would like to see how well the Glider glass wiper works on a window, check out this video. If your windows are double-glazed, but not triple-glazed, and up to 28mm (1-1/8-inch) in thickness, you’ll want the Glider D-3. It has the strongest magnets of all three models. This is the most powerful double-sided magnetic glass cleaner that Tyroler sells. Although you might think buying this one is better than buying the S-1 or the D-2, it really depends on the windows you’ll be cleaning. The D-3 is harder to use on single pane glass because it’s so strong, but the S-1 wouldn’t work through double-paned glass that’s an inch thick. If you have a variety of window types to clean it may be worth your while to purchase more than one kind of Glider. The D-3 comes with a safety string to protect the exterior half from falls. It has four rubber squeegee blades and comes with two microfiber cloths that last up to 300 washes. Please store the two halves of the window cleaner with the plastic separator between them. That makes it a lot easier to pull them apart for use. Now that you’ve seen them all, here are the pros and cons of each one. We bet you can imagine how handy an invention the Glider is. The price is well worth it for two reasons: One, it’s a durable piece of equipment that’s easy to use. Two, it will save you a lot of time and money because it makes windows simple, fun, and safe to clean. You can do it yourself and save money by not paying anyone else. Choosing between the Gliders isn’t hard as long as you know what kinds of windows you plan to clean. The S-1 is perfect for single pane glazed windows. The D-2 works well on double-paned as long as they aren’t more than 20mm thick. The D-3 is the top of the line for heavy-duty double-paned windows up to 28mm in thickness. Q: What safety precautions should I consider when cleaning windows with the Glider? A: First, don’t lean out the window. With the Glider, you only need to open a window enough that you can place the exterior half of the Glider on the other side of the glass. Make sure you place the safety string on your finger or close it in the window to secure it. Second, these tools use strong magnets. Don’t ever try to place a finger or body part between the two halves to separate them or see how strong they are. Being pinched by magnets is no fun at all. Q: How can I wet the outside of the window? A: Spray your cleaning liquid along the edge of the window that’s closest to you. Use the Glider blades to push the liquid along in front of it, then turn the Glider to scrape off the extra fluid. You can also wet the microfiber cloths and place them on the Glider halves to wipe down the windows before you use the squeegee blades. Q: What about extra microfiber cloths? A: We wondered the same thing. At the time of writing the manufacturer wasn’t selling extra cloths in a pack by themselves. Our tip is to try to find similar cloths or rags for sale, then experiment with those to see if the Glider handles them well. But with durability up to 300 washes, you’d have to use them every day for almost a year before you need to replace them. Q: Who is the manufacturer of the Glider? A: Tyroler is an Israeli company that makes a series of home cleaning tools including the Glider. They’ve been in business for almost 20 years and their products are quite popular in their home country. We like the Glider so much we don’t mind cleaning windows anymore. We hope these reviews helped you find the best tool to ease your tasks at home. Check back soon for more helpful articles about the best gadgets you can buy. Could you send me details & cost of your glider window cleaner product please, I live in Ireland. So if you could include cost of package & post also ? Hi Lian Brandshaw , Please click a link to Amazon to know more about details and cost ! Thank you ! Hi. I bougt two years ago the D2 model and it worked perfectly until the squeegee rubber blades went degraded with not too much using. I tried to cotact the manuacturer to get spare pieces, but no answer received. Please, could you help me with this issue? Cleaning windows will be easy with the Glider D-3 Magnetic Window Cleaner. The post Contains Really Lot of valuable Information. I really Gathered lot of information from your Post. I have a 4.5 cm glass thickness windows, would you have a d-4 or d-5 cleaners that can accommodate this thickness. Not sure if I need a d2 or D3. I live in Florida and we have Hurricane IMPAC windows. What do you recommend. I would love to give a great review BUT I have waited months for this window cleaner to arrive I have sent a number of Facebook messages and waited some more. No one gets back to me at all. All I receive is a standard office message to be patient. I have lost patience. I would like to receive the product or get a refund but have no way to contact anyone to discuss. This is not customer service nor is it trendy. I ordered one from Trendy Hangout almost 3 months ago and have not received it or even a reply back from the company. Of course they have my money, is this product a scam?? Hi. I bought the product ans have not received it. Where should i call?